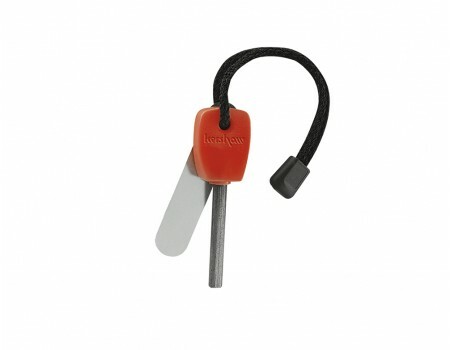 Kershaw's Fire Starter always strikes a spark even in damp conditions. The magnesium alloy firesteel shaft is good for up to 3,000 strikes and the chrome-plated steel striker is easy to hold and use. The bright red molded plastic handle makes it easy to locate and use, and the nylon cord keeps the shaft and the striker in one place. Kershaw's Fire Starter also lights camp stoves and gas barbeques. In an emergency, the brilliant spark can be used as an emergency signal.